The AudioCodes Mediant 500 Enterprise Session Border Controller (E-SBC) is a compact, high performance VoIP connectivity solution for small enterprises and branch office locations. The Mediant 500 connects IP-PBXs and unified communications platforms to any SIP trunking service provider, scaling up to 250 concurrent SBC sessions. 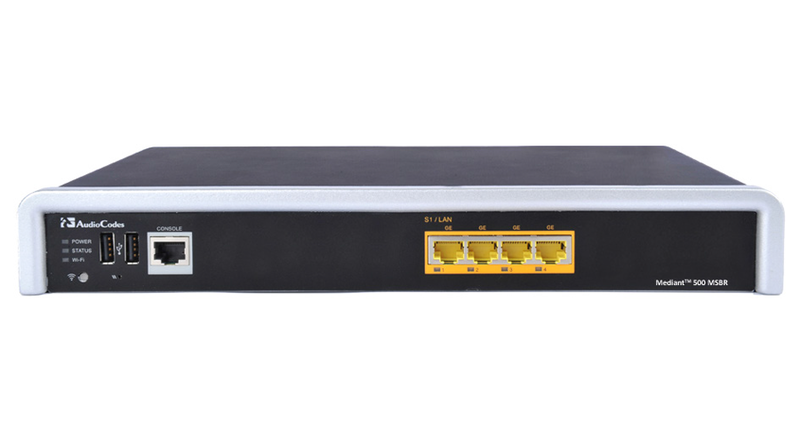 It offers superior performance in connecting any SIP to SIP environment, legacy TDM-based PBX systems to IP networks and IP-PBXs to the PSTN, supporting a single E1/T1 interface with 30 voice channels in a 1U platform. It also ensures secure and reliable communications for branch offices in distributed enterprise communications deployments. Supporting various ISDN PRI protocols such as EuroISDN, North American NI-2, Lucent™ 4/5ESS, Nortel DMS- 100 and others. It also supports different variants of CAS protocols, including MFC R2, E&M immediate start, E&M delay dial / start and others.